This evening, the Waterstones Children’s Book Prize was announced. Another book prize? I hear you moan. But actually book prizes can be really helpful in identifying book recommendations for your children, as most awards tend to be judged by experts in the field – those in the industry or children themselves! The shortlist for this year’s Waterstones prize was particularly strong – you can scroll down and see them at the end of this blogpost. The categories are split into three: illustrated book, fiction 5-12 years and teen. Then an overall book is chosen as the winner – and tonight it was Blown Away. I did review Blown Away by Rob Biddulph in my Christmas penguin blogpost last year, but wanted to revisit it to explain why I think it’s a worthy winner. It tells the story of Penguin Blue, who flies his brand new kite, but gets swept away and taken on a journey far away from his native land. Those animals who try to rescue him are also taken along for the ride. The text rhymes, which makes it good to read aloud, but it’s the multitude of small detail that wins it for me. The animals from Antarctica are amazed when they stumble upon a jungle island, because, as Rob points out, green is not a colour they’ve seen before. The ending of the story also sits well: Rob explains that after his long journey away – this penguin isn’t made for flying. It’s a superbly neat ending for a penguin picture book. There are great small details on each page – you’ll have to buy a copy to see the insides – but they include the seal’s washing (and the surprise post in his postbox), the numerous signposts, the numbered clouds in the sky, the name on the ice cream van, the texture on the sea – and even the endpapers. You can buy a copy here. 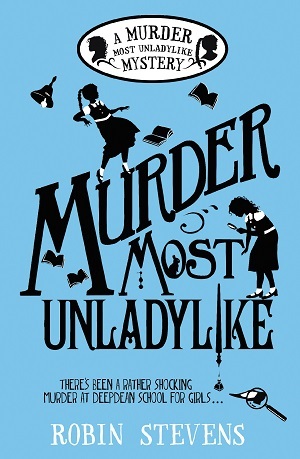 The book that won the 5-12 years fiction category was Murder Most Unladylike by Robin Stevens, described as an Enid Blyton/Agatha Christie mashup. It’s fabulous, and one I have recommended on a individual basis many times. I fully intend to blog on the appeal of this new series and Robin Steven’s fantastic writing and characterisation when I get a minute. You can buy a copy here.